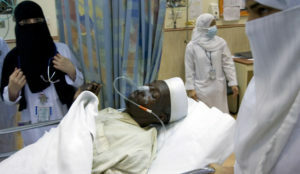 Our education system is improper: some Saudi nurses pass a test after undertaking it four times! A nurse can only get a professional license to practice the skills when she can pass a test. Dr. Sabah also briefed that we are out of Saudi nurses as the nation deem this profession as highly dishonorable! As the nurses have to work in a mixed environment, people believe that it is not a good profession. We have to inform the people about the importance of this profession for the society. The shortage of Saudi nurses is also attributed to non-availability of proper quality education and training in public and private sectors, lack of trained teaching staff and lack of health labs. Dr. Sabah also disclosed that people hold a belief that nursing education is easy and take their education lightly. This is a wrong belief and those who stick to this belief fail the tests. And test failure causes quitting of the profession. Dr. Sabah also told that the Commission has shown the lenient attitude towards the nurses who have graduated from renowned universities. However, some of the nurses are required to attend cardiopulmonary resuscitation (CPR) training.